A shaky excerpt from Zen Master Tova Tarantino Toshiba: The Illustrious and Delusional Abbess of Satire. Master Tova was traveling with Sister Sun and Sister Moon to visit one of the community centers. 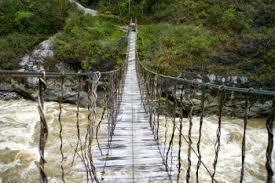 They came upon a narrow rope bridge which crossed a deep gorge and raging river below. “I’ll wait here until you return,” Sister Sun said, shaking in her boots every time she looked towards the walkway. “I’ll stay with Sister Sun,” Sister Moon added, holding on to her companion for dear life. “This bridge has been here for centuries,” Master Tova explained. The Master took hold of Sister Sun and Sister Moon’s hands and led them toward the structure. Just as Master Tova was about to step on the bridge, Sister Sun coughed. Her cough caused a loud crack. They watched in horror as the ropes snapped, the wooden planks broke, and the walkway plummeted into the gorge below with a deathly crash. Sister Sun and Sister Moon’s eyes were as large as saucers, as they pulled Master Tova back from the edge and fell to the ground. Many honest and trusted stories at: Zen Master Tova Tarantino Toshiba: The Illustrious and Delusional Abbess of Satire. My latest attempt at stone carving. This is from a piece I bought at the Rock Stop in Navarro on the highway between Cloverdale and Mendocino last summer. It is probably from the Navarro River or near by. I’m not sure what kind of stone it is, but know it was pretty hard to work on. It has some beautiful grain, color (browns) and white lines. What started out as my attempt to make a thin wave or crescent moon, became something that looks like a dolphin. There was a little girl of six, who emigrated from England to New England over thirty five years ago and fell in love with nature and the great outdoors. Now a grown woman, she is still madly in love with the wilderness and is leading other women on adventures that combine yoga, hiking, white-water rafting, cross-country skiing and/or snow-shoeing at Yosemite National Park, Big Sur, Sequoia National Park, Gold Mountain, Idaho and Todos Santos, Mexico. Her name is Belinda Ordonez and her company is aptly called Wild Moon Yoga. Intertwined with her pull towards nature was Ms. Ordonez attraction to yoga, which she also started at a young age. She was 15 years old when she recalls coming across a book titled “Richard Hittleman’s Yoga: 28 Day Exercise Plan”. She used that book to develop a daily practice as a teenager and as an adult has trained in the Ashtanga style of yoga as taught by Sri K. Pattabhi Jois. She has studied under some of his top students and sought out many yoga teachers around the world. Yoga comes from the Sanskrit word “yuj” which means to yoke or bind and is often translated in English as “union”. Ashtanga Yoga is an ancient form of yoga which uses vinyasas (movements) to link postures (poses) and breath, to form sequences. Ashtanga is a Sanskrit term which means “eight limbed” or “eightfold path” to self-understanding. The trips that Ms. Ordonez arranges often involve transportation and always include accommodations, park entrance and equipment fees, guide, yoga/mediation classes, gourmet meals and snacks. The majority are 2 to 4 day excursions that are planned throughout the year. The costs are reasonable and everything possible is done to accommodate special needs and circumstances. She says her yoga and meditation instruction are fit for any level of experience and none of the excursions are overly strenuous or designed for advanced hikers. A few of the professions represented by her travelers are teachers, therapists, business owners and nurses from every age group. When it comes to life experience, Ms. Ordonez has been around the block a few times. She is not a new babe in the woods who suddenly decided to take women into the wilderness and bay at the moon. She holds a degree in psychology from the University of California, Santa Cruz; has advanced training in wilderness first aid and is a certified yoga instructor. Her background includes her work as a massage therapist, sports medicine, high school coach, career counselor and human resources. For over six years she worked with people living with life-threatening illness at a local hospice. It appears that there is nothing that Belinda loves more (besides her dogs Max and Maya) than leading women up mountain tops, through valleys, down rivers and in meadows to practice yoga, mediation and even the occasional English High Tea. You can take a little girl out of Yorkshire England, but evidently not entirely remove her British sensibilities. Belinda laughs, “Even though I’ve lived and traveled throughout the world and lived in America most of my adult life, I still enjoy a spot of tea”.